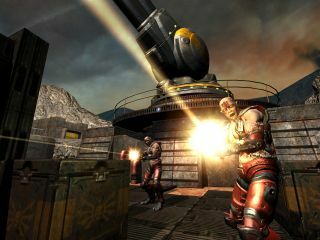 Apple's renewed push to make its Macs a grown-up gaming platform will be aided by Doom and Quake legend John Carmack. At this year's World Wide Developer Conference (WWDC), Carmack showed off id Software 's latest 3D game engine, dubbed "id Tech 5" running on a Mac. A game demo using the new engine looked like a delicious blend of the PS3 hit Motorstorm and the pod-racing sequence from Star Wars: The Phantom Menace. It's a taste of things to come. Carmack developed the 3D engines that powered both Doom and Quake. He claims that id Tech 5 " will power games that contain vast outdoor landscapes that are completely unique to the horizon, yet have indoor environments with unprecedented artistic detail." The demo shown at Apple's WWDC is only indicative of the level of detail and texture that can be applied to games. Id Software's next project is a secretive first-person shooter that Carmack says "is somewhat different from anything that we've done before". While the game is still being built for the Mac, PC, Xbox 360 and PlayStation 3, the Game Planets website is hosting some camera footage of the WWDC demo here: watch the id Tech 5 demo .